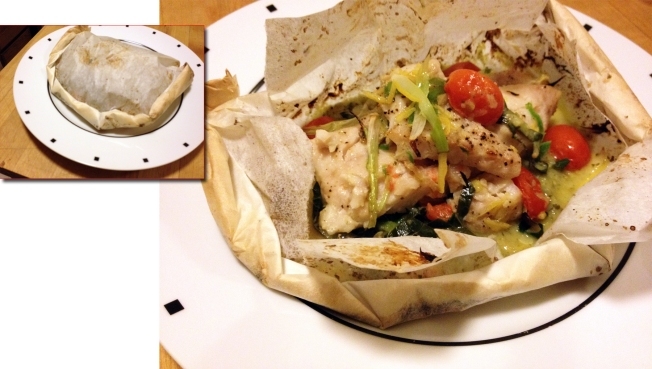 Give a traditional French dish, like fish en papillote, a regional twist with salsa, collard greens and jalapeños to personalize your recipes. I was in Tiburon, California, at a dinner party hosted by one of my best friends. The dinner was a group effort and required that each course be made by a different person. Also, each dish was supposed to relate regionally or ethnically to the person who created it. Being from Texas and having family roots in Louisiana, I chose to combine a few elements to make a customized dish. I took a traditional French recipe, fish en papillote, which gives a nod to the French influence of Louisiana, and then added truly Texas and southern flavors. I created a tomatillo salsa, used jalapeño zest and added collard greens, a staple in my parents’ household in Houston. My goal was also to use seafood indigenous to the Gulf of Mexico. Ideally, I’d use gulf red snapper and gulf shrimp, but those were not as easy to find on the west coat. The results were very successful and I think this is a great challenge for all of us. Try taking a traditional dish that you already enjoy and add your own regional or ethnic flare. You’ll be surprised at how easy it can be to me a new recipe that is unique you. Tomatillo Salsa: Combine tomatillos, onion, garlic, jalapeño, water and vinegar in a saucepan. Bring to a boil and simmer for 20 minutes. Strain ingredients, reserving the liquid. Transfer ingredients to a blender. Add avocado, chopped cilantro, lime juice, and about 2 tablespoons of the liquid. Blend until smooth. Add more cooking liquid if necessary. Transfer mixture to a saucepan and season with salt and pepper. Bring to a boil and then reduce heat and simmer for about 10 minutes. Remove from heat. Allow mixture to cool and then transfer to an airtight container. Store in the refrigerator until ready to use. This recipe makes much more salsa than you need for the fish dish. It stores well and is great with tortilla chips. But, you can cut the recipe in half, if you like, and still have some left over. Prepare Packets: Place a sheet of parchment paper on a work surface. Fold in half and then open the paper up again to the full 15" square shape. Spread about 1/4 cup of tomatillo salsa on the parchment (roughly a 4" smear lengthwise), about 1" away from the crease. Top with 1 1/2 cups of julienned collard greens. Top greens with 1/4 of the chopped shrimp. Top shrimp with the fish fillet. Depending on the length of the fillet, I have often cut a portion off the end and stack the pieces in the packet. Season with salt and pepper and drizzle about 1/2 tablespoon of olive oil on top. Mix together green onion, jalapeño, lemon zest and ginger and put about 1 tablespoon of the mixture on top of the fish. Pour about 1 tablespoon of white wine over fish and then top with the tomatoes. Fold the free half of the parchment towards you over ingredients. Fold the long end together. Starting in the middle of the long end, crimp the edges together in a rolling fashion in one direction until you've crimped and closed half of the pouch. Go back the center crimp and do the same to the other side. Press the seams down with your hands to help hold the seal in place. Arrange packets on a baking sheet and place them in the oven for 12 minutes. Remove from oven and place a slit across the top and then allow your guests to fully open the packet. Oven temperatures vary greatly, so you might want to experiment with one packet the first time you create this dish. However, because the packets are sealed, the steam that is created will keep the ingredients moist if you cook the fish a bit longer. If you have any questions or comments, please send me an email at wayne@waynesweekend.com or follow me on Facebook or twitter.